Food for thought: Write a question you have had about birds or a specific species of bird. 1. How many different Orders of birds are there? 2. Explain the difference between a bird call and a bird song. 3. You may know that hummingbirds sip nectar. What else do they eat? TAI - (Think about it) How does that impact their ecosystem? 5. Many ducks nest on the ground. Where does a wood duck nest? 6. Select any two birds listed in the etext version of Life Histories of North American Birds. Techie question: Suppose your library has one print copy of this book. How is an etext version a better resource for a large class that is researching birds? 7. Name the three parts of a bird's wing and the role each plays. 8. Most owls nest in trees. Where does the Burrowing Owl nest? Why do you think they adopted this nesting place? 9. What plant fuzz does the American Goldfinch use to line its nest? How does that impact their nesting behavior? 10. Cedar waxwings eat fruit. How does their food choice impact them? 11. 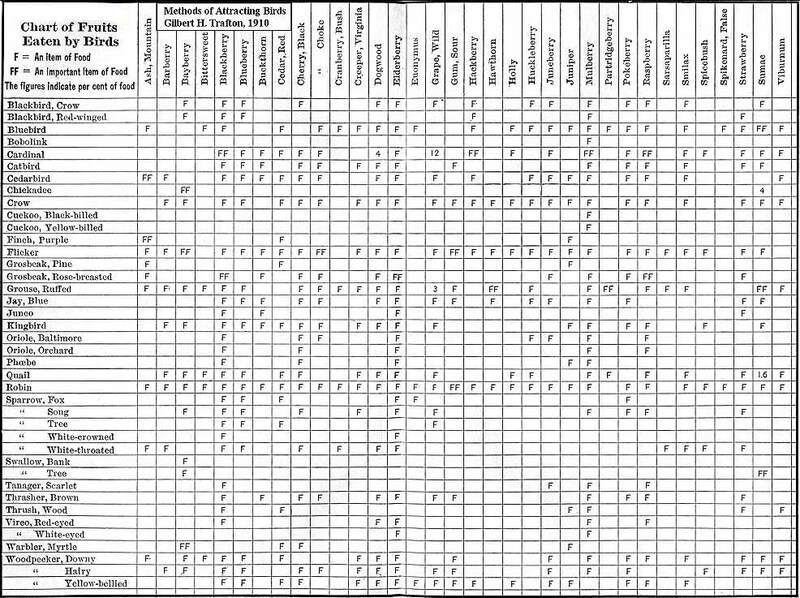 Examine this chart of fruits that North American birds eat. Name three trees/plants that are consumed by many different birds. Name a couple of birds who are picky eaters. Which bird is the most flexible eater? Which bird has the better chance to survive? Explain your choice. 12. Biology is the study of living things. A scientist who focuses on biology is called a biologist. What do you call a scientist who focuses on ornithology? 13. Classification is a way to order our study of living things. Write the classification of eagles beginning with Kingdom. 14. Go find the answer. Which has a higher body temperature: Birds or humans? 15. If the ability to make and use tools sets humans apart from other animals, what do you make of this discovery? Based on this, how can a farmer encourage more chickadees to come to his orchard? Challenge: Your class has decided to erect a nest box at your school. Great! the potential challenges created by a nesting bird family. For which bird would you choose to provide a box? Do this Dichotomous Key activity for two of the species. Make a Dichotomous Key for a species of bird that lives in your region. Trace the taxonomy of a bird of your choice. Check out a bird cam. Name the birds you see. Learn Bird Songs The Ivory-billed Woodpecker is not gone! Hawk Mountain Sanctuary Do wind turbines have an impact on wild birds? Emergence - How does the "intelligence" of an ant colony or the stock market arise out of the simple actions of its members? Read this bird book with a young friend or make a themed book of your own! 2004 Cindy O'Hora / Posted 8/2004 utd 4/2016. Save a tree - use a Digital Answer Format - Highlight the text. Copy it. Paste it in a word processing document. Save the document in your folder. Answer on the word processing document in a contrasting color (not yellow) or font (avoid Symbol, , or other ornate artistic fonts). Save frequently as you work. Enter your name and the date, in the header of the document. Submit your document via electronic dropbox or email attachment. Bad things happen. Save a copy of your work on your computer.